The epitome of Nasty architecture, the unpleasant step-child of Brutalism, dominates the corner of 14th Street and 5th Avenue, arguably a gateway to Greenwich Village. There stands a building so outré in its refusal to fit in that I question the motives of its architect, Roger Duffy (ironically, like Gordon Bunschaft, also a partner at Skidmore Owings and Merrill partner). It strains credulity to think that this building was drawn–-figuratively speaking — on the same SOM drafting tables where Bunshaft created The Beinecke Rare Book and Manuscript Library fifty years ago. This wound on a major site in New York City marks fifty years since A&A and Beinecke were built, and makes a fit comparison. It, too, is an academic commission (by The New School for Social Research) and, like the Yale buildings, clearly intended to assert its own importance as a University Center. Duffy’s 370,000 square foot Leviathan arises in the midst of a mix of post-war white brick apartment houses, masonry masterpieces from the 30’s, and a new, quite elegant low-rise building just across 13th Street that serves as a counterpoint to the University Center as a reminder of restraint, discipline and simplicity. 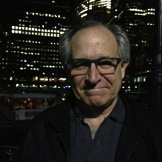 Many buildings have a signature, usually a dominant design element, to which they are reduced: Johnson’s Lipstick and Chippendale buildings, Norman Foster’s Gherkin, or Saarinen’s Whale. This might be called Duffy’s Gash. There are actually two major design elements, which are, in a way, contradictory. First, the brass “clapboards” and ribbon windows refer politely to Joseph Urban’s original 1936 New School for Social Research building nearby on West 11th Street. Duffy makes a gesture to context by quoting Urban’s brick treatment but then mutilates the homage with the easy and outrageous gouge of glass streaking across the West and South façades, representing—if nothing else—an outsized portion of the building’s construction budget. This grotesque stroke is meant to do what, exactly? Its apparent function is to expose the stairways of the building so we can watch students, faculty and administrators walk from floor to floor. Yes, walking from floor to floor is a fundamental part of academic life, but does it deserve such prominent display? Maybe. After all, it reveals the users of the building in a transition from level to level, certainly a synecdoche of the whole academic enterprise. Could that be how Roger Duffy pitched the Nasty image to his clients while they sat with open checkbooks at Skidmore, Owings and Merrill? 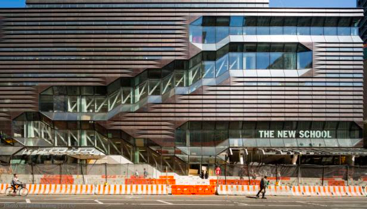 “The University Center is intended to become the “heart” of The New School. The LEED Gold building will provide space for all aspects of a traditional campus, with 200,000 square feet of academic space on the first seven floors and 150,000 square feet for a 600-bed dormitory on the levels above. Blah. Blah. Blah. Whoa: “Three iconic fire stairs”? The phrase pokes through the archi-babble like the gash itself. How and why does a stairway get bumped up to “iconic”? Iconic, after all, means “executed according to a convention or tradition” and implies an elevation to memorial or even reverential status. How do fire stairs merit such veneration? Their function as routes for emergency evacuation is something I would call to the attention of tenants and pedestrians only if I were being . . . Nasty. 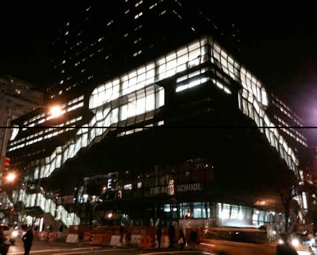 And besides, with all the other spaces in the breathlessly multi-use building intended for dorms, offices, lounges, restaurants—how does a stairway become a “hive of activity?” Yes, it shows constant motion, but all the action is elsewhere. The ultimate irony is the architect’s indisputable achievement: the building’s Gold energy efficiency rating (read environmental conscientiousness). Ironic because there is a larger environment, which you’d think any major addition to the campus would consider. 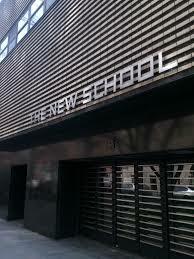 After all, The New School is, like Greenwich Village, an environment, with an identity that arises in a quite specific history. During the 30s and 40s it was a safe haven for countless émigré academics in flight from the Nazis. These émigrés were European in their formality, rigor and clarity. 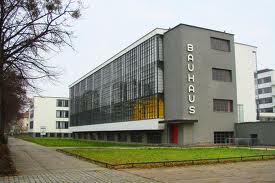 Think Bauhaus, think Hannah Arendt and Leo Strauss. 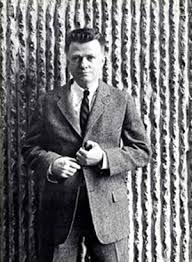 To make Roger Duffy’s porridge of postmodernism a nominal center of the New School and its diffuse campus flies in the face of the intellectual and esthetic foundations of the school. And despite the LEED rating certifying the building as non-polluting and energy-efficient, it brazenly intrudes on the neighborhood. Duffy’s intrusion is a form of pollution. His glaring, (albeit energy-efficient) illumination is also pollution (trust me, at night you’ll expect to hear the chords of Close Encounters echoing down 14th Street). As is the uninflected size of the building, as is the Gash, which pollutes the façade and spoils the architect’s less-than-enthusiastic homage to Joseph Urban. Perhaps that’s it—the best and most succinct definition of the Nasty: pollution; pollution of the streets–careless, self-promoting, self-satisfied pollution, making a space less appealing than it was. I don’t welcome the transition, cultural, political, architectural, and psychological from Brutal to Nasty. But I make the distinction to mark the New Year on the assumption that once aware of it we can begin to avoid it like the plague it already is. I have the distinct sense that the world has swerved in the last fifty years from brutal to nasty and that architecture both reflects and sheds light upon that shift. Therefore, let’s start the New Year comparing and contrasting three buildings: one an iconic example of the extremes of Brutalism; the second, an evolution of Brutalism so extreme it set new standards for Brutalism; and the third—built fifty years later—just plain Nasty. First, what do I mean by Brutal and Nasty? Brutal is large-mannered, assertive (to say the least), unapologetic—call it overbearing—at its best exhilarating, at its worst cold, uninviting, impenetrable. Brutal confronts, engages and defines surrounding space. Nasty ignores surrounding space. Brutal dominates; Nasty diminishes. Brutal is serious. Nasty is glib, mercurial and untrustworthy. Brutal plays to win, and takes no prisoners. Nasty takes hostages. Nasty has a neurotic relationship to power, feeding upon schadenfreude, Brutal thrives on independence and self-sufficiency. Architectural Brutalism uses basic materials confidently in their unadorned state—concrete, stone, glass, and steel—preferably oxidized. 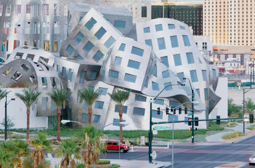 Nasty architecture communicates no apparent love of its materials, merely their effect. It uses glass, steel, aluminum, titanium, bronze, copper; whatever, wherever. Le Corbusier is the patron saint of Brutalism, along with some brilliant acolytes—Paul Rudolph, Gordon Bunschaft, Moshe Safdie, Kevin Roche—to name a few. Nasty? Its collective patron saints are all the deconstructivist “starchitects” who turn a blind eye to the neighborhoods, where they build what they will just because they can. Nasty’s acolytes are all those who regard the world as mere backdrop to their inventions without regard to scale or context or, more precisely, what on a small scale may pass as a local folly (Frank Gehry’s residence in Santa Monica, right), becomes on a large scale a neighborhood bunker bomb (Frank Gehry’s Cleveland Clinic Revo Center for Brain Health, on the left). Yes, I realize that this Manichean taxonomy might better be applied to politics or personal pathology. But I want to identify architects in this schema because architecture is the most political of the Arts, impacting real, often public, spaces, and because its practice has consequences in the polity. Architects are subject to civic codes, beholden to local approvals, obligated to safety and environmental standards–not to mention that they and their builders employ thousands in fulfilling their plans. But far more important, a building’s public influence can last sometimes centuries, defining space, place, and the community. That’s a long half-life for Nastiness and its practitioners. I have lived through the entire Age of Brutalism—that is, architectural Brutalism—one reaction to the aridity of Modernism, and the source of many brooding, dark and windswept corners where trash collects in American cities. 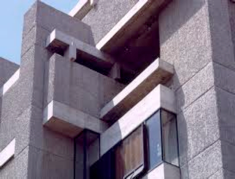 I’m thinking of some near-by examples in New Haven, Connecticut, arguably a center for Brutalism. 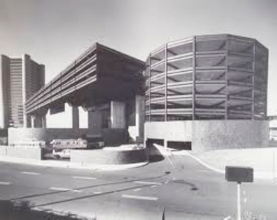 Numerous buildings come to mind including the Kevin Roche’s Knights of Columbus World Headquarters (still standing), next door to his equally Brutal New Haven Arena and Parking Structure, now merely a vacant lot in New Haven’s long-suffering downtown. But the two buildings that truly define the esthetic limits of Brutalism were, coincidentally, completed in the same year (1963), and each was a commission by Yale University. 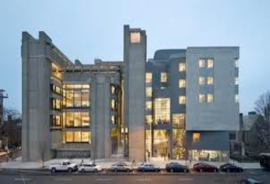 One is Paul Rudolph’s intricate (if that’s a word I’m permitted to use in connection with Brutalism) Art and Architecture Building (A&A), which has survived since its opening , frequently renovated and recently restored at great expense to Yale. 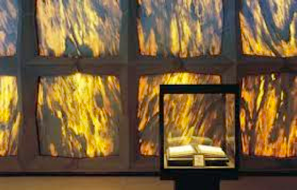 The other is The Beinecke Rare Book and Manuscript Library designed by Gordon Bunshaft, then of Skidmore, Owings and Merrill. The Brutalism of the 114,000-square-foot A&A was nothing if not hard-won. The concrete was poured into wooden forms, but the finished slabs lacked the jagged textures Rudolf had envisioned: instead, a uniform ribbed surface remained. This brought a team of masons hoisting themselves over the exterior and interior walls hammering away at the concrete until the perfect texture was produced. This was only the first of many setbacks that dogged A&A throughout its history; for example, in 1974 there was a costly purge of exposed asbestos, which Rudolph had used, reportedly, as much for its flaky texture (unfortunately the flakes would fall like snow) as for its thermal properties. But an even greater scandal involved the designated users of the building. Yale commissioned the building to house two of its professional schools. Without question, Rudolph did not hide the fact he favored the architects. The wonder is he favored them so crudely and disruptively. It was never surprising that the painters resented being squirreled away in the basement levels cut off from the natural light reserved for the architects above. Indeed, when fire engulfed A & A in 1969 (there were few doors, and apparently no fire doors whatsoever), the painters used the fire (reported by some—probably falsely—as having been set by an Urban Planning student “in protest”) as an opportunity to demand improvements. 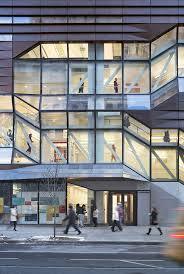 They were never fully accomplished until 2008, when Yale completed both a renovation and an addition to A&A. 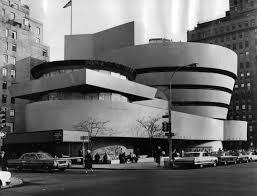 But the controversy brought into sharp focus the Brutalist esthetic and psychology. The wonder is that the spirit of Brutalism can be stretched as far as it was in another building on the Yale campus. 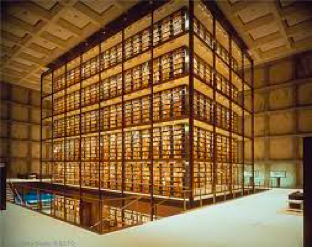 Completed the same year as Rudolph’s overbearing A&A building—Gordon Bunshaft’s exhilarating masterpiece of geometry and materials, the Beinecke Rare Book and Manuscript Library, just a five-minute walk from A&A. Beinecke hovers over a public plaza. Its neighbors are the neo-classic Commons (where Yale Freshmen dine); Woolsey Hall; and the offices of the President and the Corporation of the University. Beinecke is the very opposite of A&A—an implacable rectangular solid, rendered in white travertine squares framed by grey granite, floating over a band of dark glass, set on a slim pillar at each corner; it vibrates between simplicity and complexity, monumentality and breathtaking delicacy—evoking at once the scale of Brutalism and the poise of its neo-Classical neighbors. 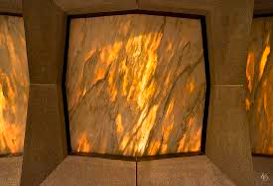 Each of the 3/4” marble panels (which detractors, looking for trouble, have compared to television screens) is so thin that daylight shines through the stone, illuminating the interior in the caramel and ochre glow of the translucent marble; it references the marbled edges and leather bindings of the rare books shelved within a soaring clear glass cube rising as the central core of the interior. Pretty amazing. I’m mentioning Bunshaft’s and Rudolf’s buildings together not only because they represent the extremes of Brutalist esthetic—one dangerous, the other relatively safe—but each is a considered building which gives us an opportunity for intimate engagement with the architect. 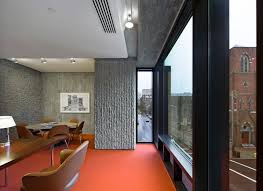 I am confident that Rudolph walked through every inch of his building, savoring its variations of light and texture, traversing the polished concrete floors and sinking into the plush persimmon carpeting, turning a corner from cozy alcove to expansive vista. All without benefit of computer graphics. 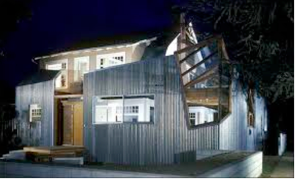 Notwithstanding Rudolf’s impolitic blunders, I am not surprised that the most recent transformationof (and addition to) his building by Gwathmey Siegel, have changed the critical tune. 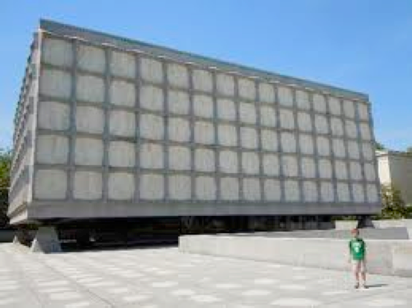 More to the point, the Brutalist esthetic has been established as a major impulse of Modernism, embracing buildings as potently problematic as A&A and as sumptuously simple as Beinecke. 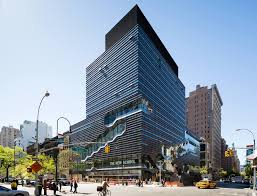 Neither building is an obvious fit in its neighborhood, but each enhances the neighborhood, sets it in motion, invigorates it, like the Guggenheim did decades ago as it spiraled up on its street corner of the Manhattan grid. Certainly neither is modest nor shy about its size. But just as Frank Stella could not have executed his monumental steel pieces in miniature to the same effect, size matters in Brutalism; the sheer weight of the materials often flirts with gravity, seldom shy about gravitas. This is serious architecture for serious people. But where are the massive planes of yesteryear, the heart-stopping cantilevers and heroic architectural engagement of space and material? While its eyesores remain tenacious, its glories are being overshadowed by the Just Plain Nasty, which includes all of those buildings that have appropriated the aggressive forms of Brutalism without its soaring ambition and understanding of detail. Imagine Mad Max outfitted by Tommy Hilfiger. More in the next installment, where we discover Nasty in our midst.